Andrea: Once you run out of money, you’ll need to recharge your balance. There’s a couple of different ways to do this. The first way is to preload at a network mobile store. More commonly, you can buy a 充值卡or recharge card which can be found at mobile network stores, convenience stores, and news stands like this one. At small news stands like this one, you can buy recharge cards in denominations of 20, 30, 50 and 100 yuan. If you’re not sure if they carry recharge cards, you can ask. Andrea: Now this is important, they are asking which mobile network that belongs to you. If I don’t tell them the right one, recharge card will not work on your phone. So I just purchased a SIM card from China Mobile, I’m going to tell China Mobile. 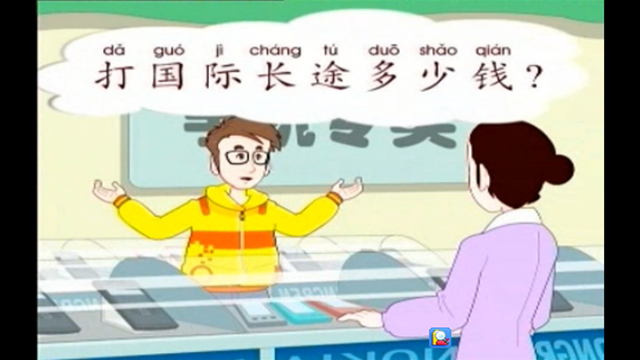 GRAPHIC FLASH: 有充值卡吗？有 to have, 卡 card, 充值卡charge card, 吗 a particle here, 有充值卡吗？Do you sell mobile phone charge cards? 这款手机能上网吗？Does this mobile phone have Internet access? 这款手机保修多长时间？What is the warranty on the phone? 打国际长途多少钱？How much does it cost to make an international phone call? 我想要这个手机卡。I want to get this SIM card. 请选择一个手机号码。Please choose a mobile phone number. 有充值卡吗？Do you sell mobile phone charge cards?